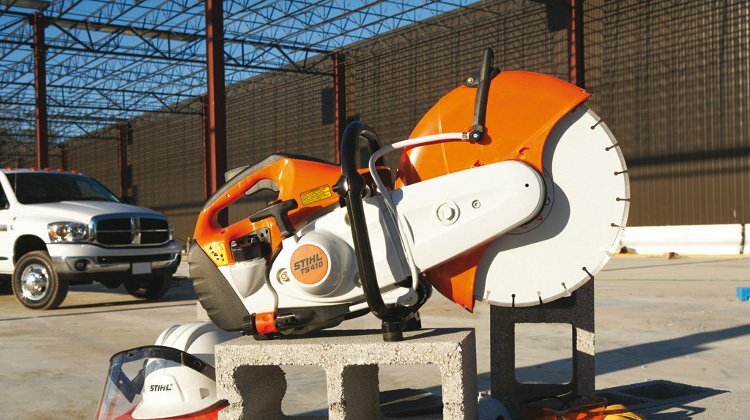 Gasoline cut-off saws are a simple and extremely robust tool that will easily last for many years if treated with respect and maintained regularly. During normal operation it is absolutely imperative that the correct fuel/oil mix is always used. An incorrect mixture leading to a lack of lubrication is by far the easiest way to ensure an untimely death for your cut-off saw. Examine the whole machine for loose nuts, bolts and clamps, tighten as necessary. Clean dust, dirt and foreign objects from cylinder head and block coolings fins. Check for signs of fuel leaks and take any necessary action. Check that throttle and choke controls operate correctly and take any necessary action. Check that the cutting wheel does not turn when the machine is idling, adjust carburetor if necessary. Check that the cutting wheel is in good condition, never use a cutting wheel that is cracked, or heavily chipped. Check the condition of all air filter components, replace or clean air filter components as recommended by the manufacturer. Dust and dirt escaping the air filter and getting into the engine will shorten the life of your machine. Check condition of filter in fuel tank. A damaged filter can cause dirt to enter the carburetor and cause poor starting and running. A dirty filter will reduce fuel flow to the carburetor which will cause poor running. Check tension of cutting wheel drive belt. You should be able to depress the v-belt between 5mm and 10mm with moderate thumb pressure. Over-tensioning will cause premature wear of the belt, under-tensioning of the belt will cause slipping and subsequent poor cutting. Check that the spark plug is resonably clean and adjust the electrode gap. If the spark plug is exceptionally dirty investigate the cause. Check the spark arrester in the exhaust system, replace if it is blocked or missing. Drain and clean the fuel tank. Run the engine until it stalls to empty the carburetor. Remove the cutting wheel, loosely re-attach the thrust washer and mounting bolt. Clean the machine and remove all dust and debris. I always spray mine with WD40 for good measure. Store the machine in a dust proof box or cover with a suitable cloth. Store in a locked location out of sight and out of reach of children.